Bear bile farming is an alarming practice taking place in China, whereby Asiatic black bears are captured and used to provide bile from their gall bladders. The bile is an found in popular ancient Chinese medicine. The bile extraction process is extremely painful for the bears, and is hardly ever performed in a sterile manner. 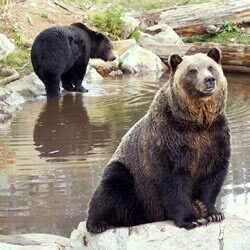 In fact, about half of all bears caught for their bile end up dying from complications of the procedure. We need to end this inhumane act of torture immediately. Send a letter to the World Society for the Protection of Animals to support their efforts to abolish bear bile farming forever. I am writing to voice my support for your efforts in protecting wild bears from bear bile farms in China. I was appalled to learn of the inhumanities being committed against these innocent creatures. It's hard to believe that we've come so far with animal rights, and yet these bears are still living in tiny cages, being treated like cattle, and are experiencing such health complications as gallstones, infected wounds, and internal bleeding as a result of the substandard care they receive. Most often, the bears are left to die. Though this practice is heinous, I find comfort in the fact that the WSPA is doing all it can to eradicate it. I commend your efforts in talking with Asian governments to educate them on the consequences of bile farming, as well as working with Asian doctors to create alternatives to the highly sought-after bile. Please continue the fight for these bears. They need organizations like yours to step up and defend their survival.